a conference and thank you for all staying for the closing session. 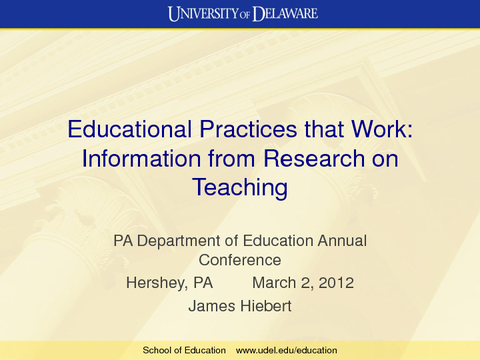 I'd like to spend the minutes I have addressing the theme of the conference, which is educational practices that work. I'd like to begin with a pretty sobering fact, and that is that teaching hasn't changed much in the United States for as long as we've kept records of teaching, which is about a hundred years. what's different about their solutions. So students were asked to try and explain how the solution set for one of these equations would be quite different than the solution set for another. few of you in this room are engaged in something like this already. So your job is to help spread the word and help your neighbors, help your peers engage in somewhat the same kind of thing. it's something like any other skill that we can all continue to study and practice and improve over time. A second assumption, teaching is something that's owned by each individual teacher. You do your own thing, so we close the classroom doors when we begin teaching. Wouldn't it be weird if you were teaching and people just sort of walked in and sat down and watched you teach? whatever learning goals you've identified are critical for your study. The weekly meetings must begin and end on time. Sounds sort of silly, right? But it's not. It's really important. you're probably not going to see the ultimate payoff for it, but if it's a lasting process, if it's something that gets built into the culture, it's going to have huge effects down the road. Thank you so much. Please join me in thanking Dr. Hiebert again. JAMES HIEBERT: Thank you. © Copyright 2012 PDE BSE. All Rights Reserved. Feedback or Questions? Email us.